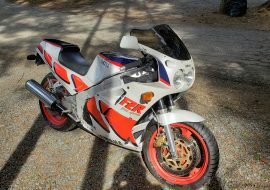 Well, last week's seemingly ham-fisted resto-mod Gamma went over like a lead balloon, so let's see how this one flies: a very bright and shiny Yamaha RZ500 fitted with some FZR bits! 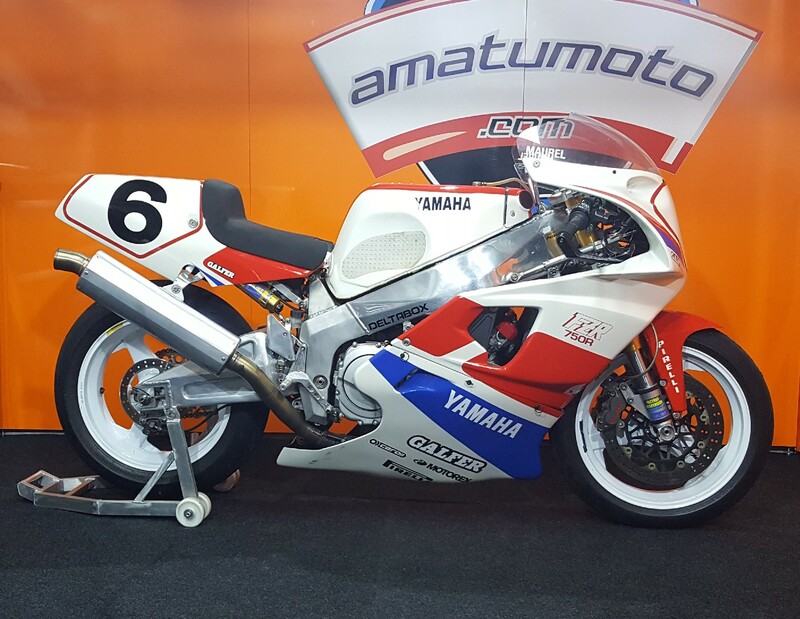 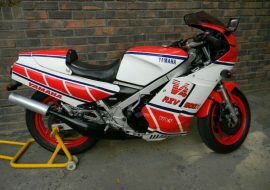 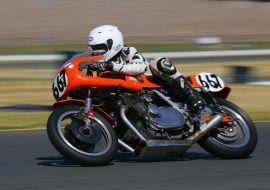 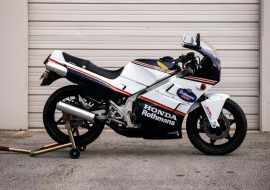 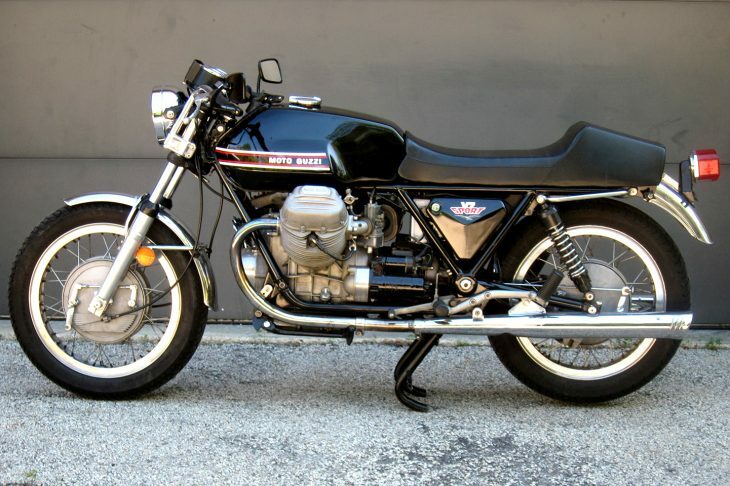 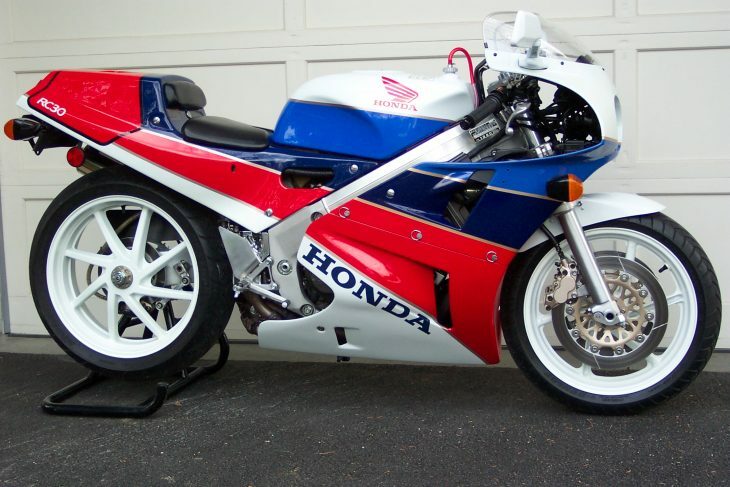 Built from 1984 to 1986, the RZ500 was also known as the RD500LC in some markets. 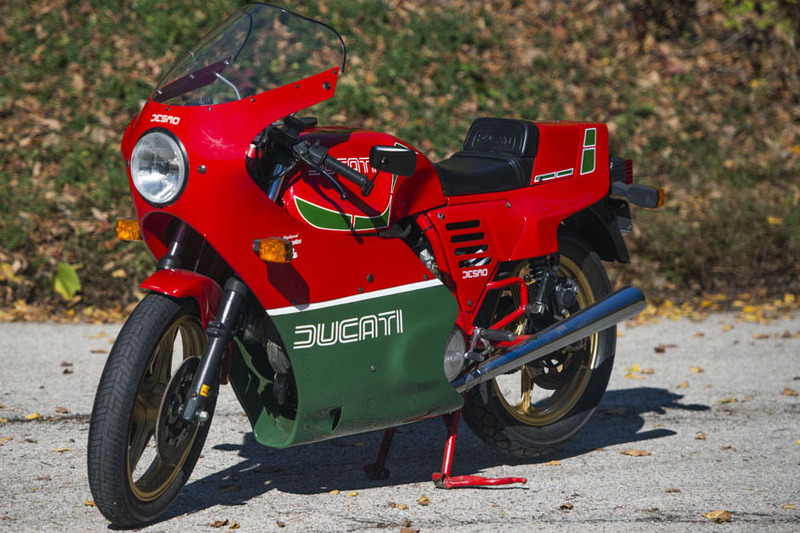 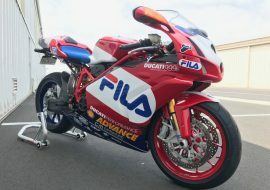 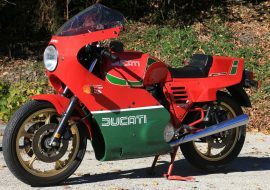 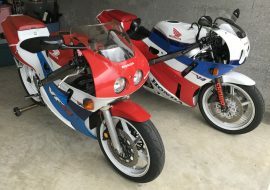 It was Yamaha's entry into the Moto GP replica wars and a direct competitor of Suzuki's equally wild RG500Γ Gamma, although most feel that the Gamma was ultimately the better bike. 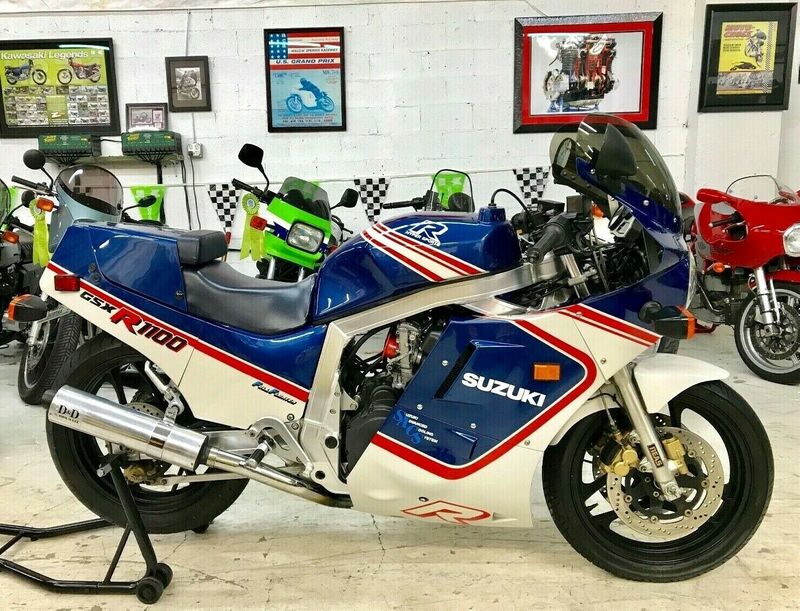 Due to emissions laws, the RZ500 was never officially imported to the USA, although some found there way here via Canada and, more recently, imported directly. 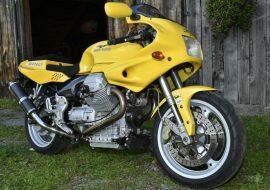 Like the Gamma, the RZ featured wild specifications: a liquid-cooled, 499cc two-stroke V4 with two cranks and 50° between cylinder banks. 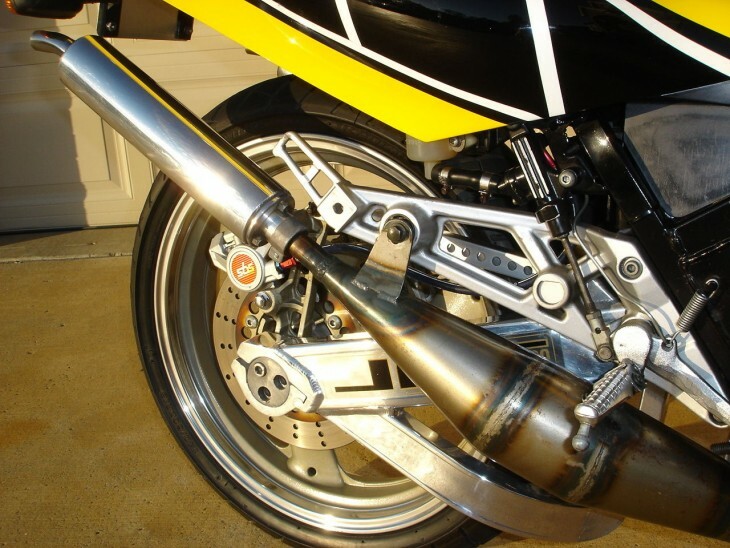 A pair of YPVS power valves and oil-injection. 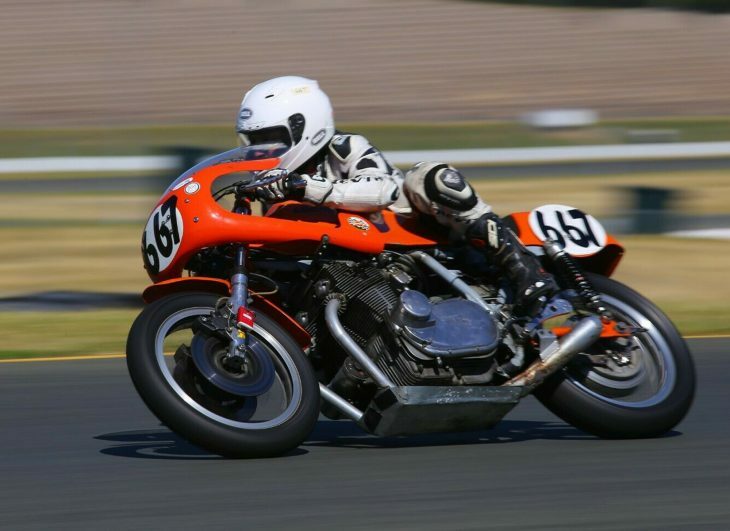 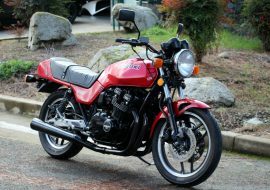 Even a balance shaft to quell vibration, and while this did improve the bike's ability as a street ride, the real advantage of the balance shaft was that it allowed the frame and other bits to be lighter. 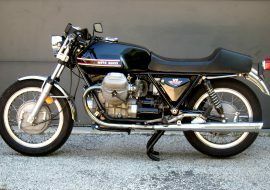 That light weight philosophy extended to the materials used, and the engine cases were made of magnesium. 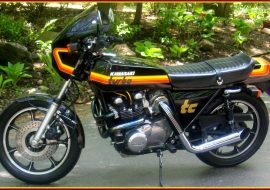 You know how I know that? 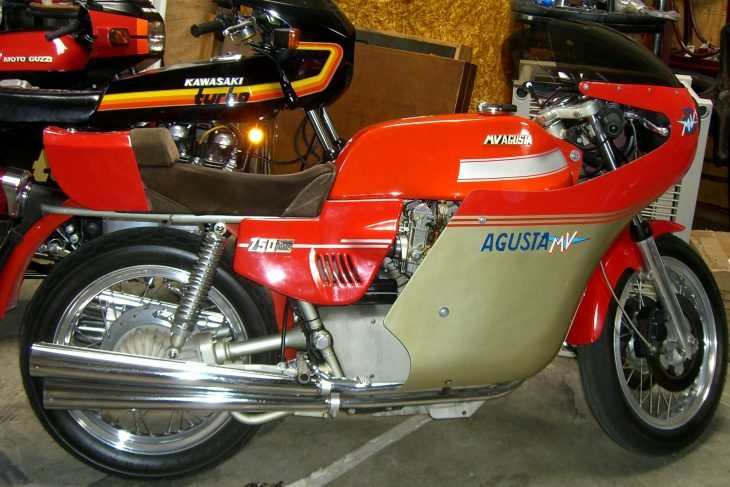 It's got "MAGNESIUM" cast right there into the cases! 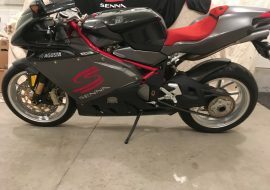 It isn't mentioned in the description, so I'll assume this bike has the standard steel frame. 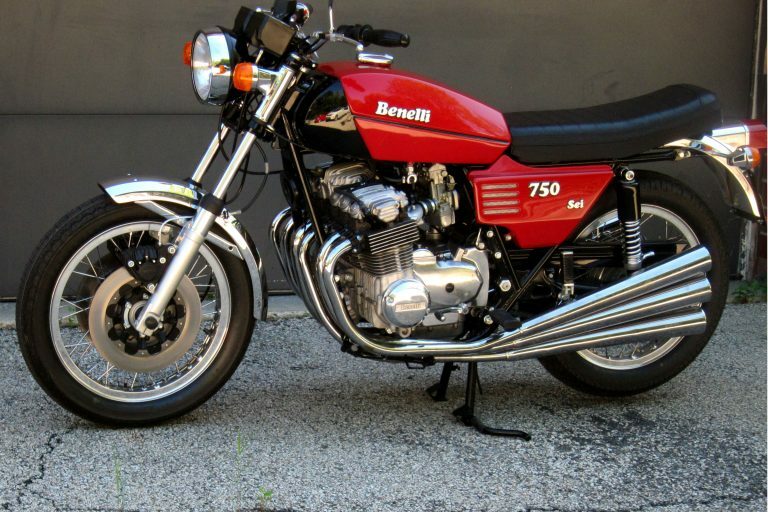 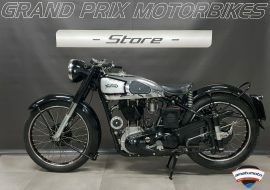 Japanese bikes actually had a desirable aluminum version of the frame that helped offset the detuned engine sold in that market. 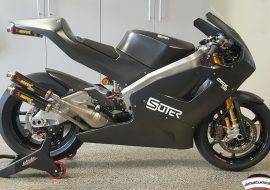 If you look, you can see the remote reservior for the rear suspension peeking out by the radiator: the rear shock was mounted Buell-style under the engine to make room for the rear pair of cylinders' exhaust. 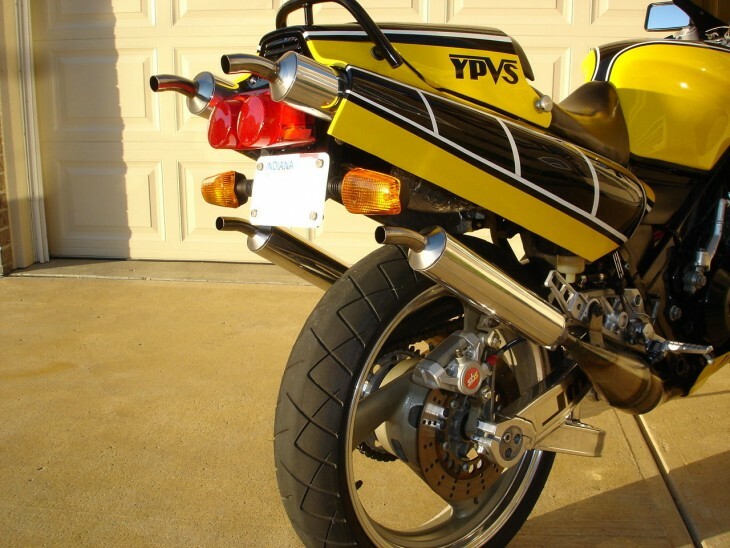 The original bike featured anti-dive forks, although those have been lost in the transition to the FZR front end, a loss I'd expect is more than acceptible, considering the other benefits of the swap. 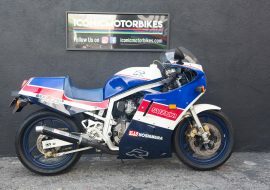 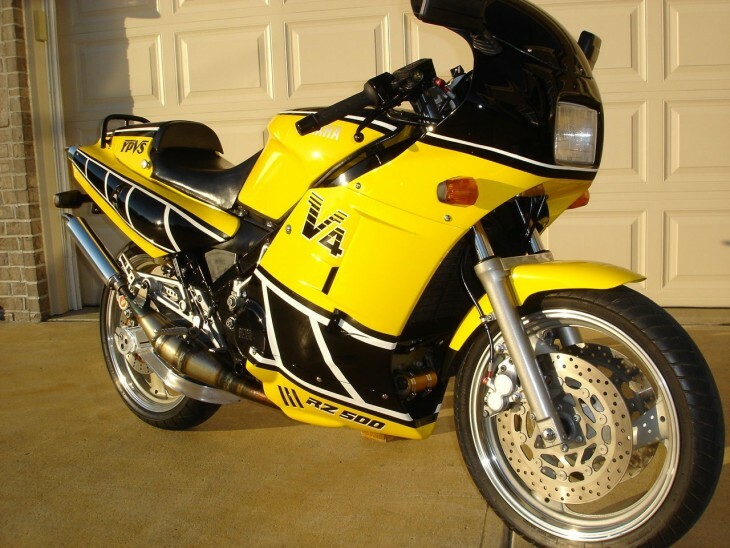 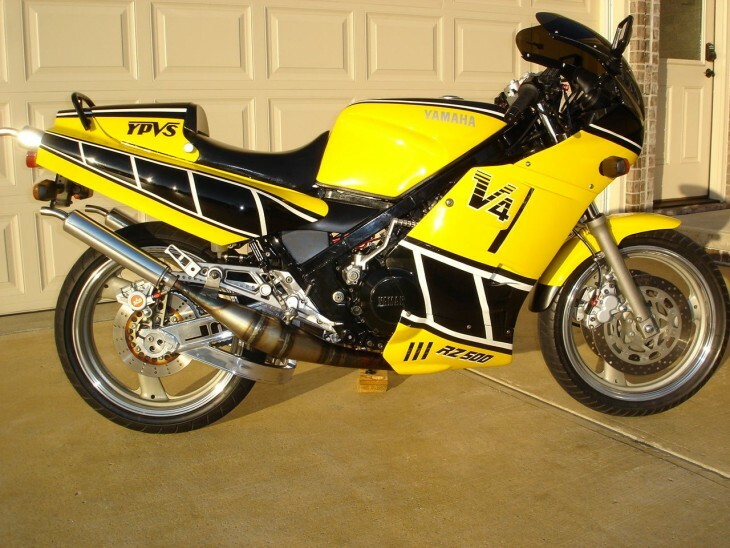 For sale is my 1985 Yamaha RZ500, 4 Cylinder Liquid Cooled Two-Stroke, Custom Painted to Kenny Roberts Replica Graphics. 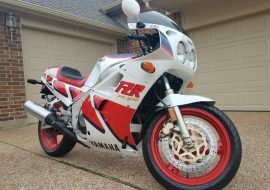 When I found this bike 8 years ago, I had to have it. 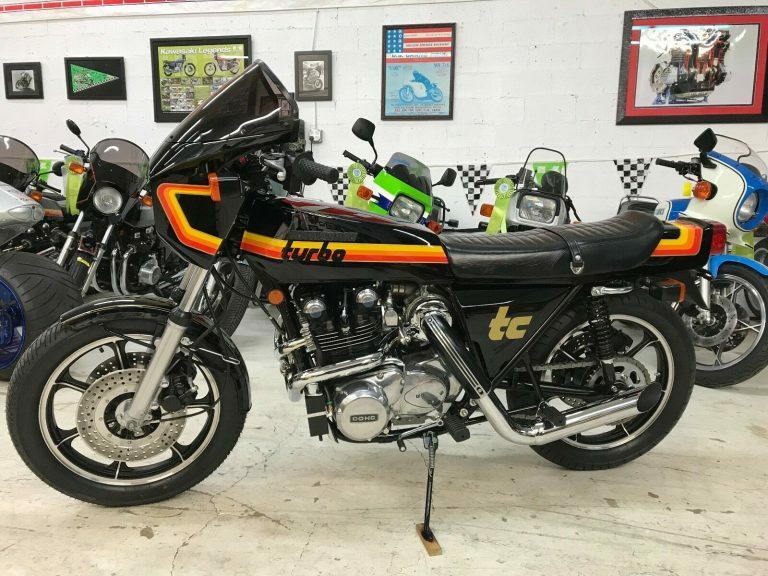 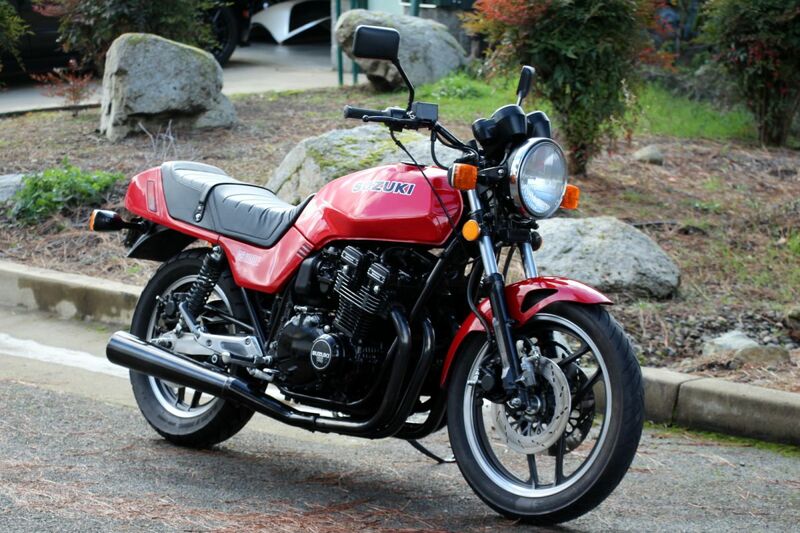 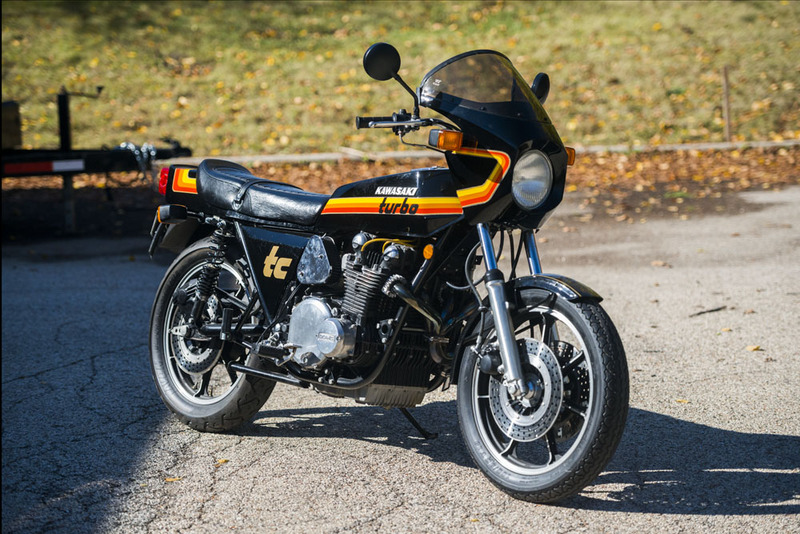 I was (and am) a big RZ350 fan and then my buddy explained to me that Yamaha made a 4 cylinder version that was never sold in the U.S.A. 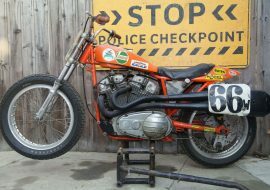 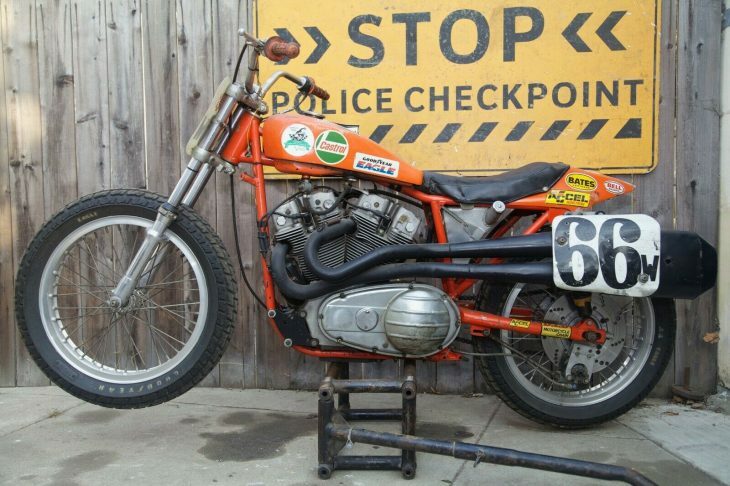 I did some research and watched over a few years then saw this bike. 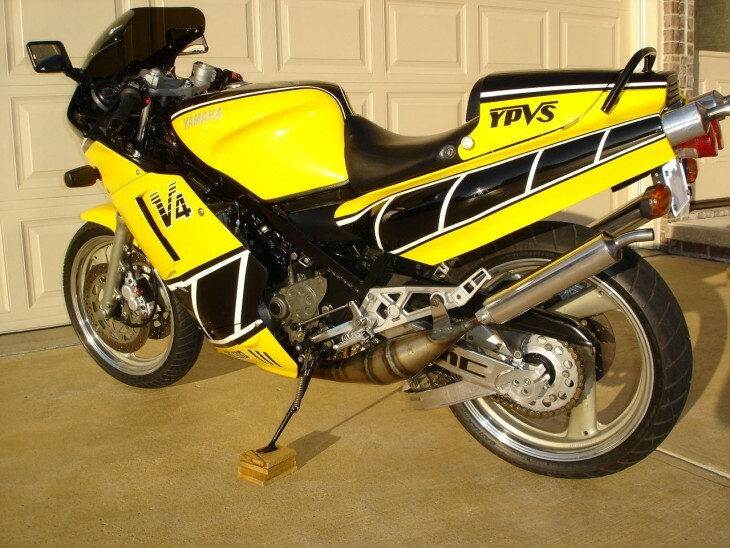 Several things immediately drew me to it which might you too but high on the list was the Kenny Roberts Paint Job. 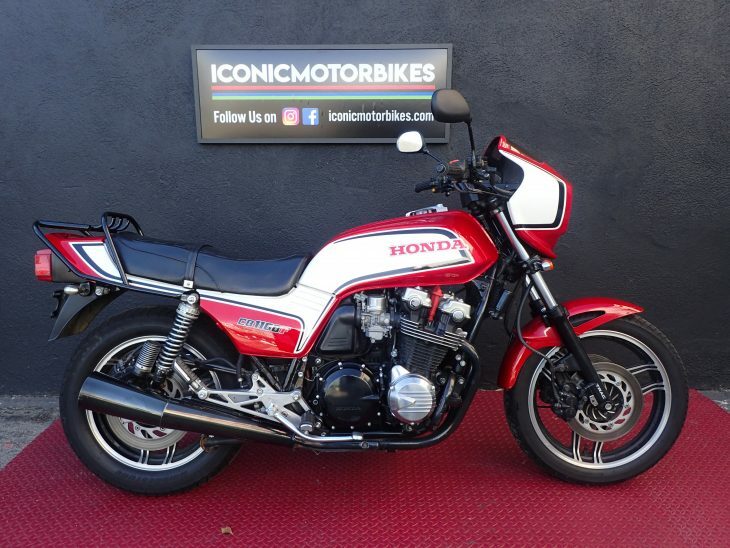 For me (a person who is by far more drawn to stock) I just can’t stop looking at this bike. 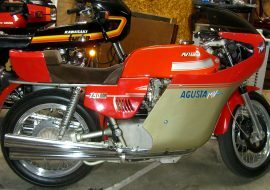 Then add to it the complete rebuild and modifications made with high dollar parts, there was no decision to be made. 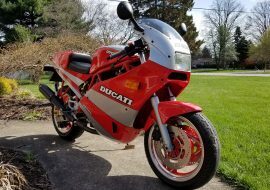 When I got it, my buddy convinced me to take a ride to the local Indy Ducati Dealer which was holding an open house event and motorcycle show. 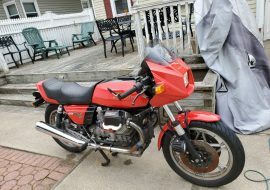 As we pulled up, two guys from the Factory Ducati Semi heard the sound and ran up to ask me if this was really an RZ500… that felt good. 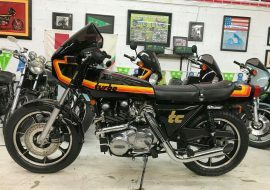 I won 1st place at that show in the “Other Class”. 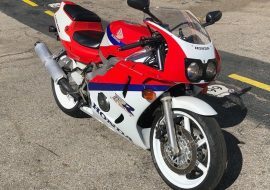 I felt a little embarrassed as there was such a crowd gathered around the bike that most had never seen before. 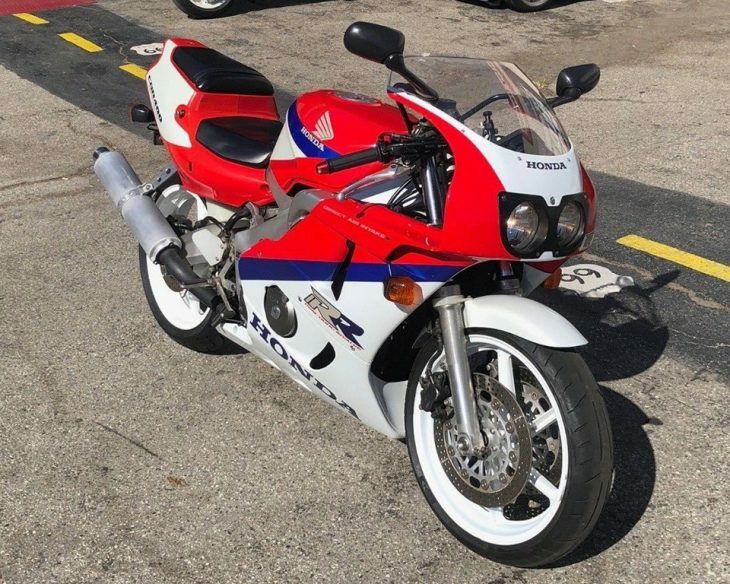 The same happens time and time again when I find the time to take it out for a cruise or to the Indy Moto GP… it just commands your attention. 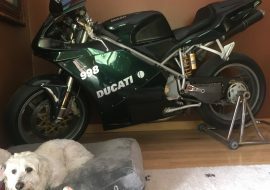 The listing is pretty comprehensive and includes much more detail, along with some additional photos, so pop over for a look. 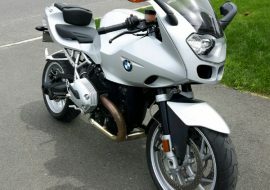 With a Buy It Now price of $14,950.00 and just two days left on the listing, the seller is looking for premium money. 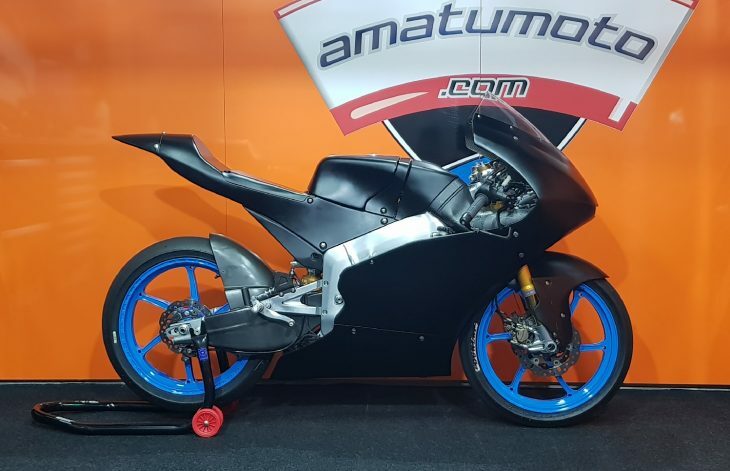 But it looks like a premium bike, with those gorgeous expansion chambers, clean bodywork, thoughtful improvements, and a 17" wheel update that should make for improved handling. 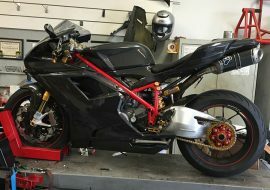 If you're okay with the updates, this is one sharp machine. 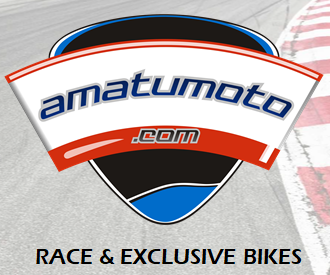 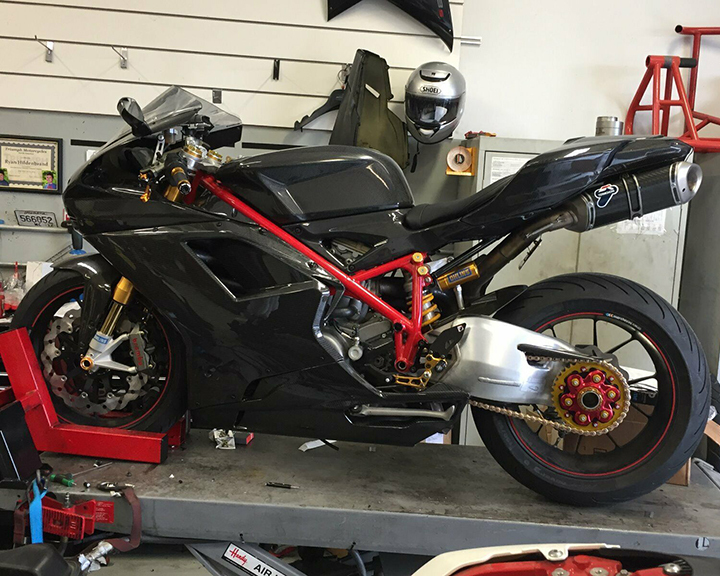 As always with these customized machines, expert opinions are welcome in the comments! 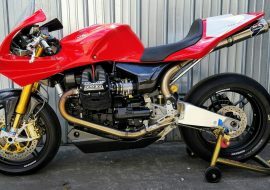 The engine is not magnesium. 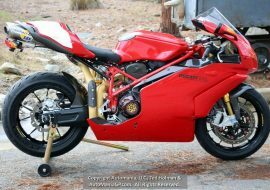 The only parts that are magnesium are the parts that are embossed MAGNESIUM. 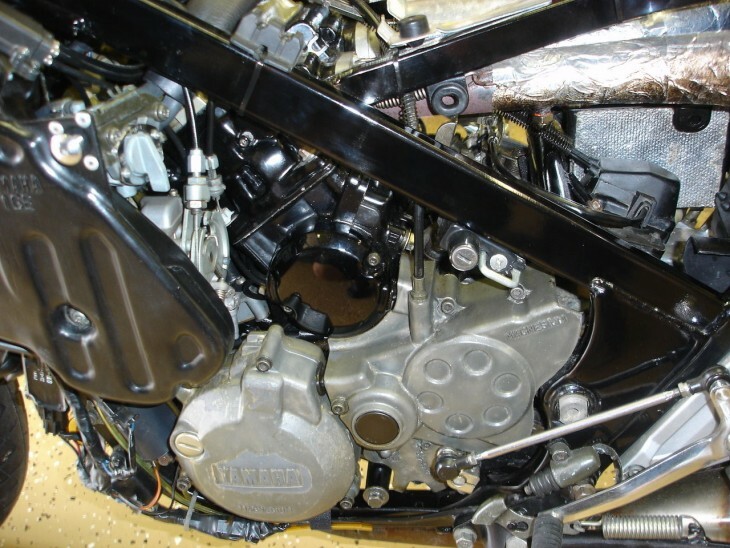 The stator cover and sprocket cover. 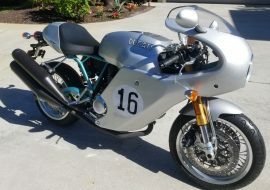 The rest is aluminum and steel. 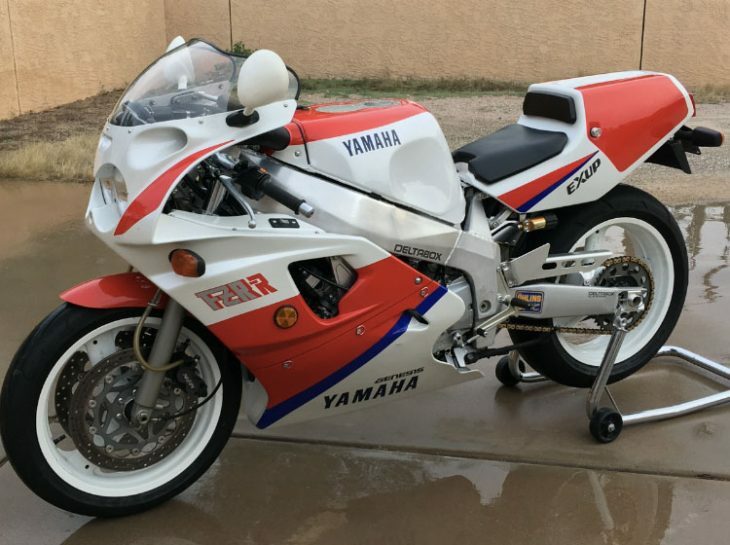 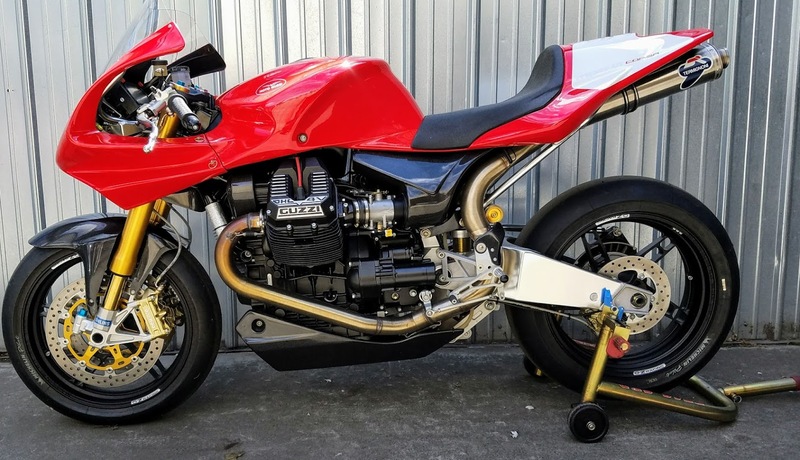 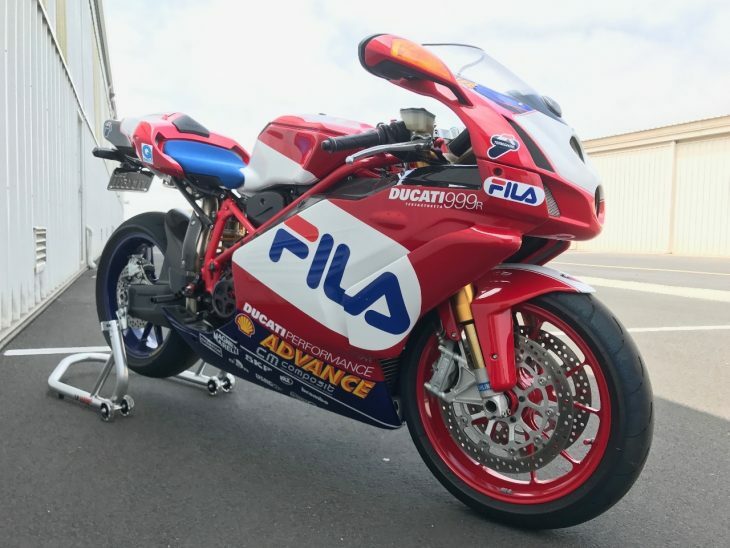 As a former owner of an rz500, rzv500, and rzv500-yzr500 replica I can tell you the seller has a lot of money in this bike. 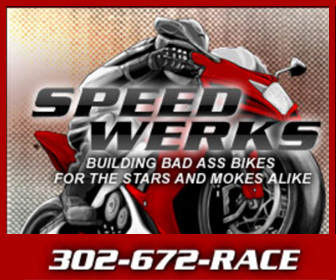 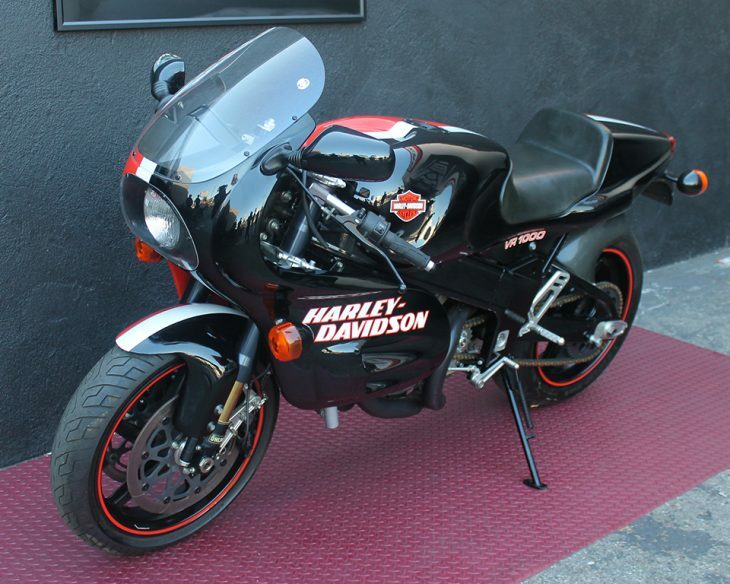 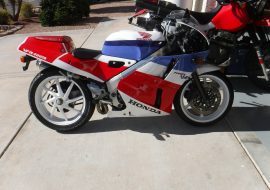 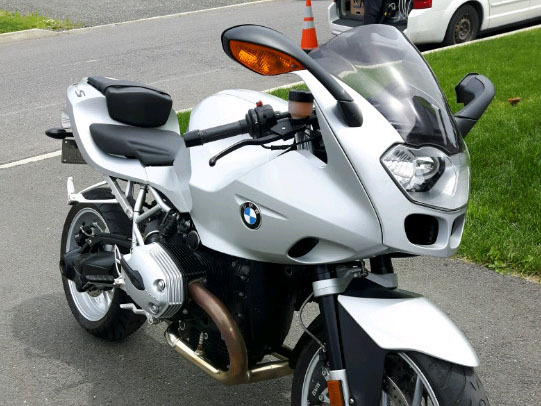 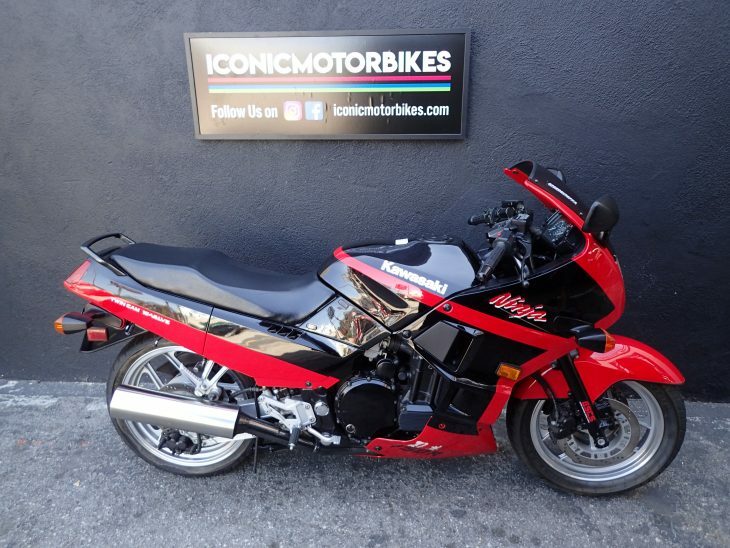 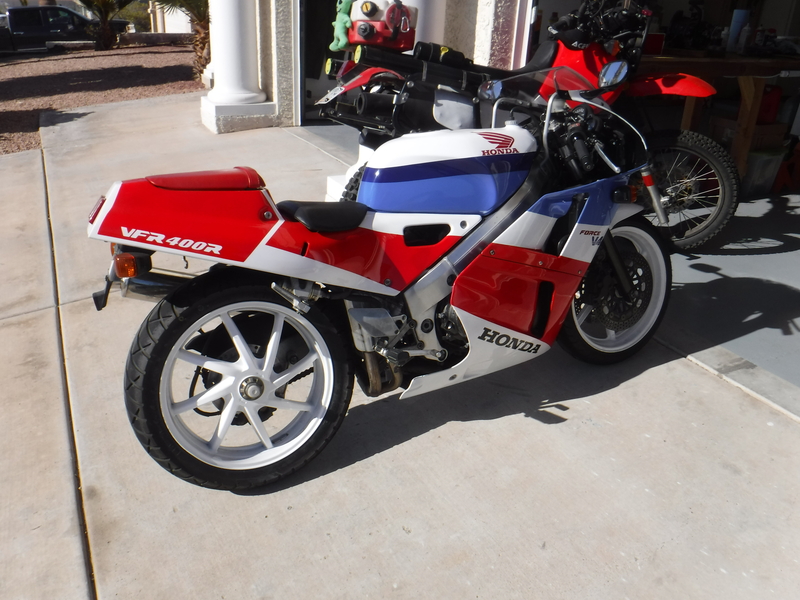 It looks nice and has the right mods for a good street bike(wheels/tires, brakes, shock, swingarm, forks, and pipes). 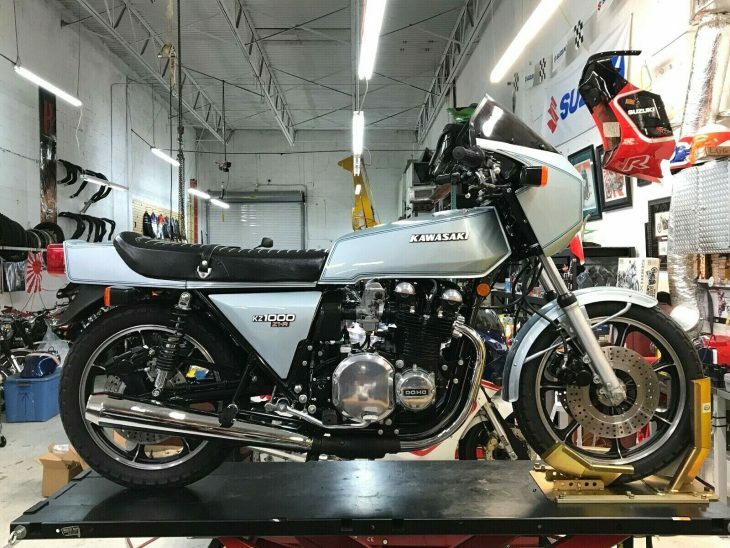 If the motor is recently rebuilt its probably worth the money. 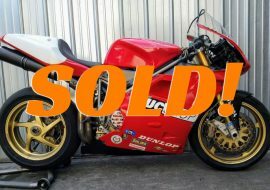 The sale was ended a few hours ago. 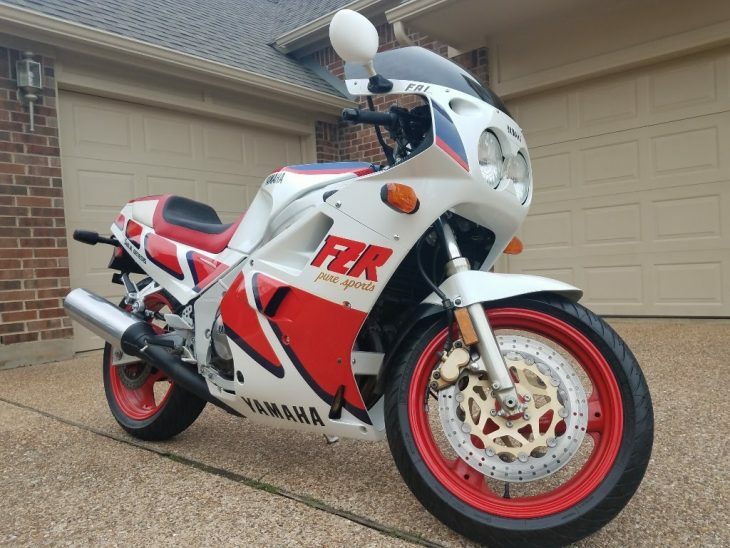 Whoever bought it recognized that value. 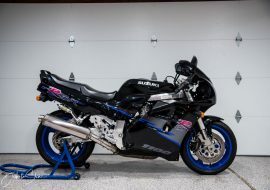 The swingarm alone would be near $1000 when shipped. 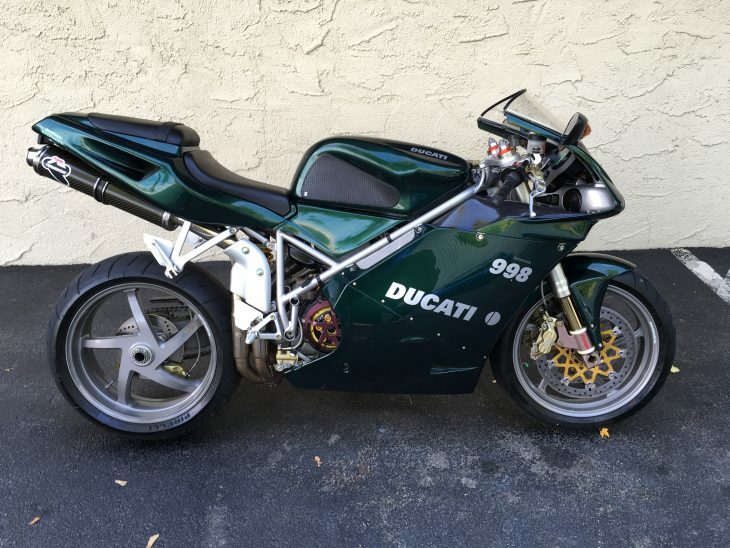 Near $2000 for the pipes. 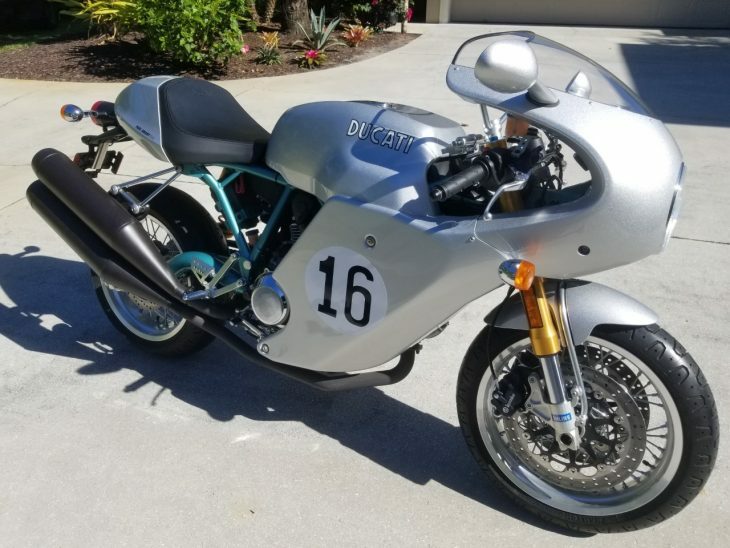 Another $1000 for the shock. 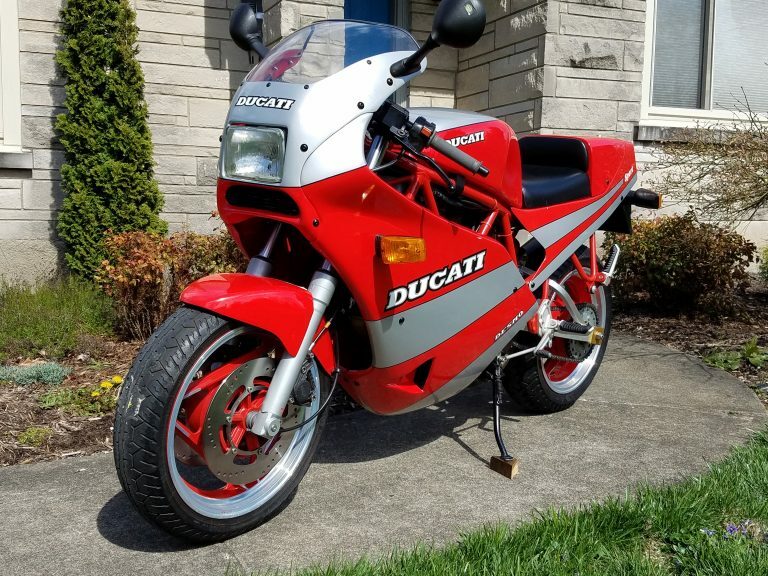 Someone got themselves a nice bike. 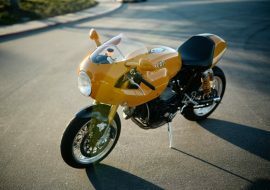 Mine are stock examples and I do prefer them like that, but this bike is giving me ideas. 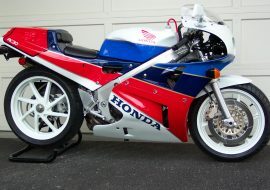 Now were talkin! 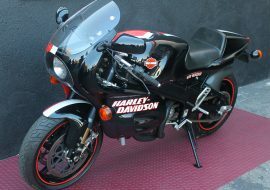 If you don’t care for this smoker, go to a Harley site!!!!!!!!!!!!!!!!!!!!!! 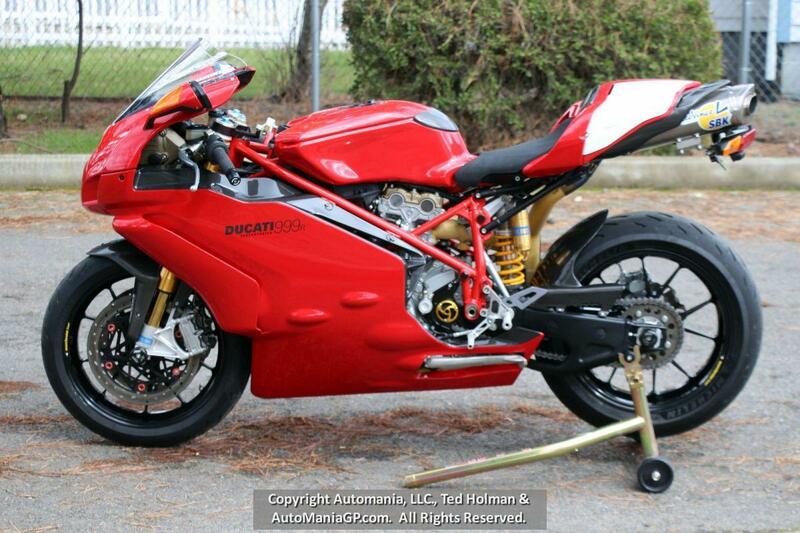 I would be stoked, smoked and stroked to thrash this goody. 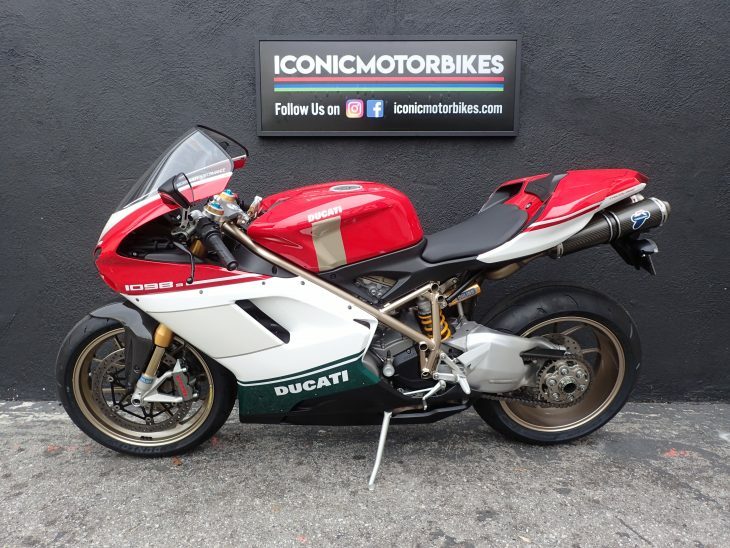 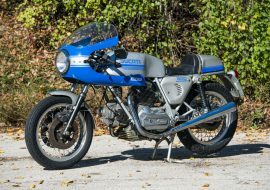 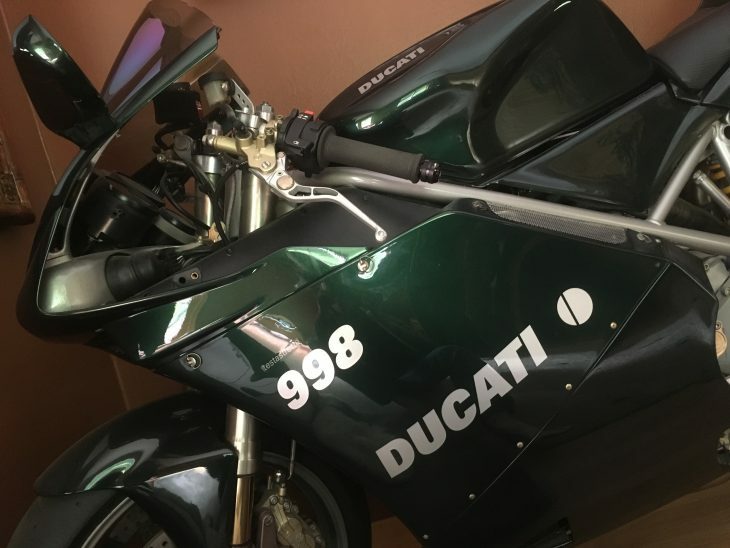 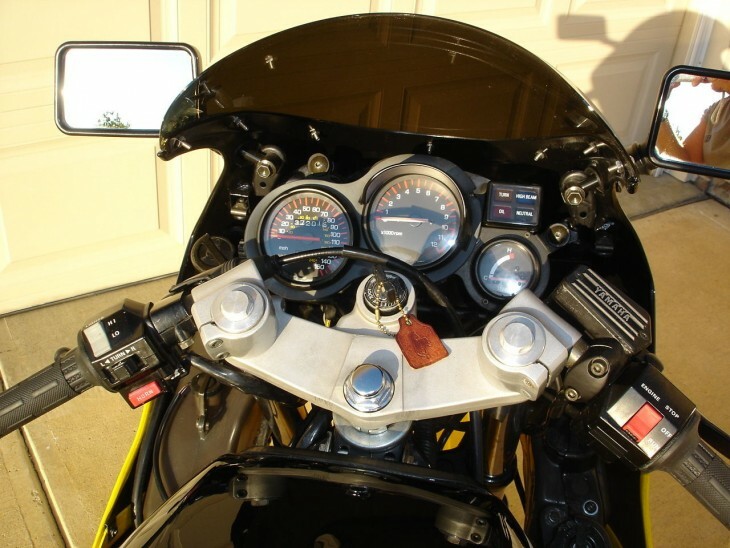 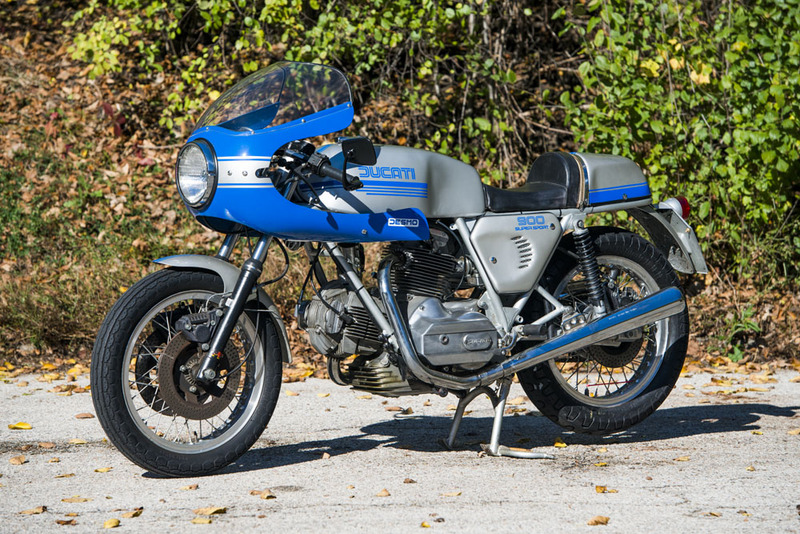 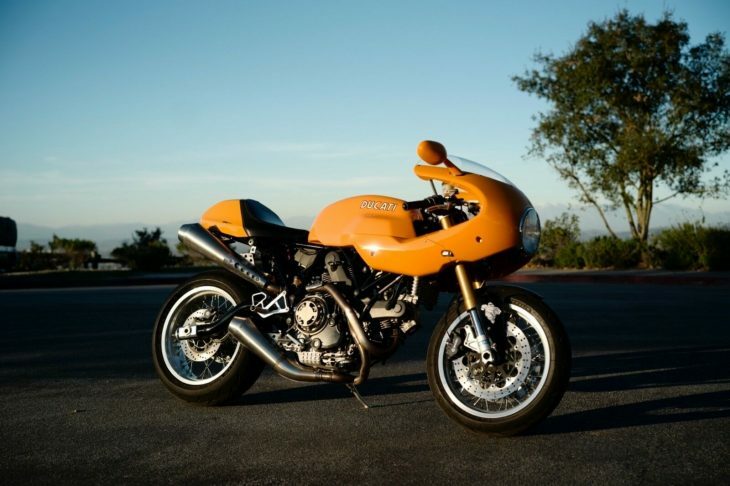 2006 Ducati Paul Smart 1000LE For Sale! 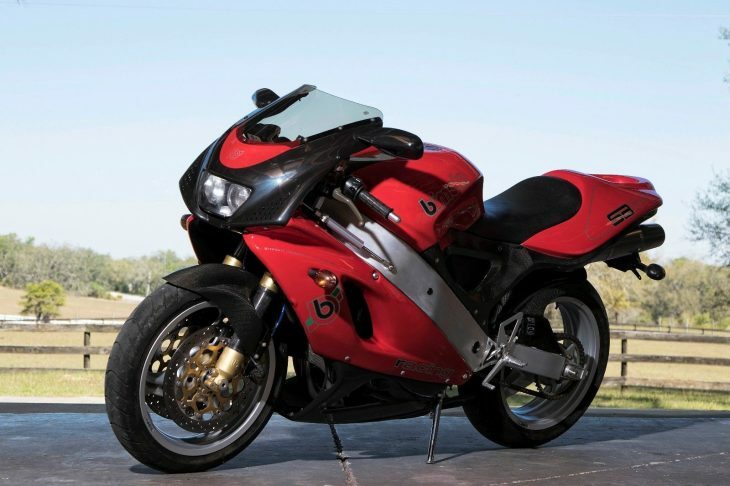 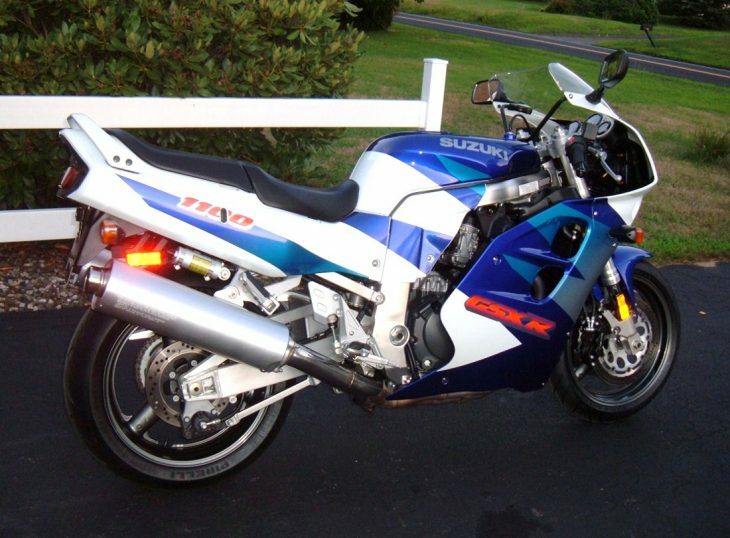 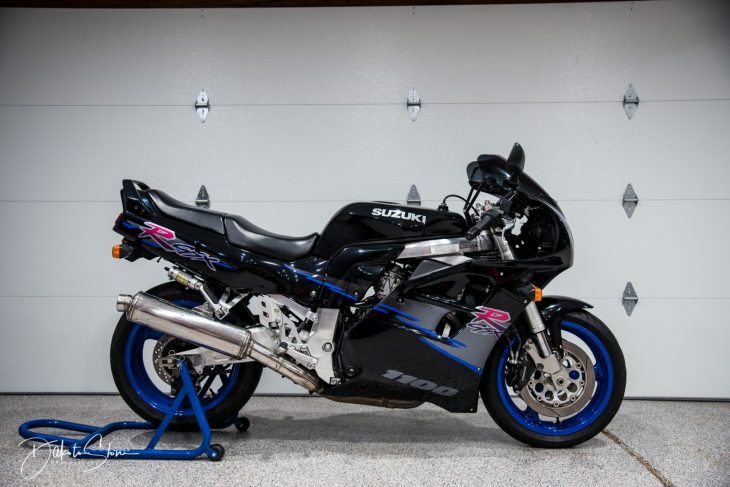 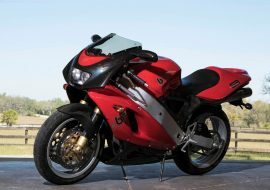 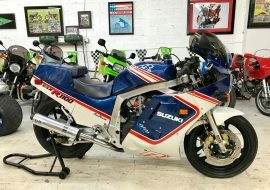 1997 Suzuki GSXR1100 For Sale!